Immunosome®-Biotinyl Cap is a Non-PEGylated product. For other reactive (PEGylated and non-PEGyalated products) biotinylated liposomes and also Immunosome® products suitable for other types conjugation methods see here. Float-A-Lyzer® with a proper MWCO that easily allows the cleanup of your liposome conjugated ligand from free and non-conjugated protein/peptide/ligand. You need to make sure that the MWCO is below 1,000,000 dalton. At 1,000,000 dalton, the pore size on the dialysis membrane gets close to 100 nm and therefore your liposomes can be dialyzed out. You cannot use dialysis cassettes blindly. Please understand the technique before using either spin column or dialysis cassette. If you do not use the correct MWCO you can lose your entire prep. For this protocol, we recommend MWCO of 300,000 dalton. The total lipid concentration in Immunosome®-Biotinyl Cap is 22.45 mM. 1% mol of the lipid in liposomes contains Biotinyl Cap group and only half of them are exposed to the outside of the liposomes, which is equal to 0.11 mM of reactive conjugable lipid. For 2 ml volume liposomes, this is equal to 2.20×10-7 mol, and for 5 ml volume liposomes, this is equal to 5.50×10-7 mol of Biotinyl Cap. 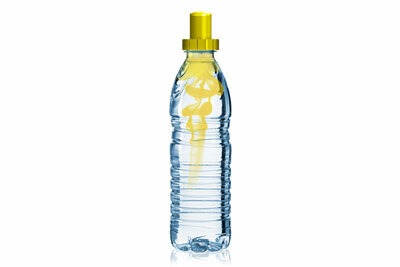 Pour Immunosome®-Biotinyl Cap in a conical tube and vortex it gently with one hand. Use the other hand and slowly add the (strept)avidin solution until the two solutions are mixed. You need to use 10-fold molar excess of strept(avidin) to Biotinyl Cap lipid. Incubate the solution for 1 h at room temperature. Remove the unbound (strept)avidin from the prep by dialysis. We prefer dialysis to size exclusion columns. Dialysis is a much slower process but there will be minimum loss of Immunosome®-Biotinyl Cap after the prep is cleaned from unbound (strept)avidin. Spin columns are much faster; however, you can easily lose over 50% of the liposomes on the spin column. We recommend using Float-A-Lyzer® dialysis cassette with 300K MWCO from Spectrum Labs. Dialyze the Immunosome®-Biotinyl Cap/(strept)avidin solution in 1 liter of PBS at pH 7.4 for 8 hours. Change the dialysis buffer with a fresh 1 liter of PBS and let it dialyze for another 8 hours. After this step, Immunosome®-Biotinyl Cap/(strept)avidin is separated from unbound (strept)avidin. Pour Immunosome®-Biotinyl Cap/(strept)avidin in a conical tube and vortex it gently with one hand. Use the other hand and slowly add the biotinylated antibody or biotinylated ligand solution until the two solutions are mixed. 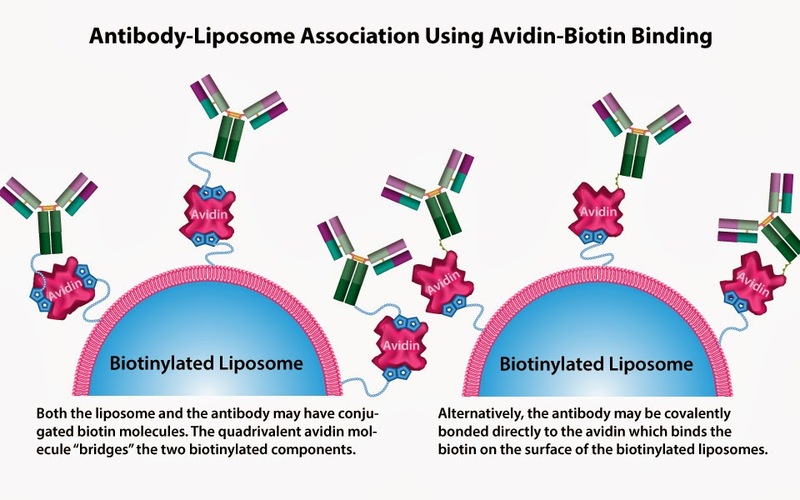 You need to use 2-fold molar excess of biotinylated antibody (ligand) to Biotinyl Cap lipid. Incubate the solution for 1 h at room temperature. The total lipid concentration in Immunosome®-Biotinyl Cap is 22.45 mM. 1% mol of the lipid in liposomes contains Biotinyl Cap group and only half of them are exposed to the outside of the liposomes, which is equal to 0.11 mM of reactive conjugable lipid. For 2 ml volume liposomes, this is equal to 2.20×10-7 mol, and for 5 ml volume liposomes, this is equal to 5.50×10-7 mol of Biotinyl Cap. 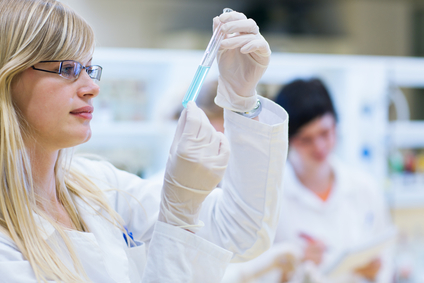 Pour Immunosome®-Biotinyl Cap in a conical tube and vortex it gently with one hand. Use the other hand and slowly add the antibody conjugated strept(avidin) until the two solutions are mixed. You need to use 2-fold molar excess of antibody conjugated strept(avidin). Incubate the solution for 1 h at room temperature. To avoid precipitation of lipid in the noncovalent approach, care needs to be employed in maintaining a high ratio of strept(avidin) to Biotinyl Cap-liposomes. Otherwise, the coupling efficiencies would be relatively low. Alternatively, Sepharose® CL-4B size exclusion spin column can be used instead of Float-A-Lyzer®. However, keep in mind that a large amount of liposomes will be loss on the column during the process. Dialysis is a much slower process that size exclusion; however, there will be minimal loss of liposomes. Immunosome®-Biotinyl Cap is a white translucent liquid made of nano size unilamellar liposomes. Usually due to the small size of liposomes no settling will occur in the bottom of the vial. The liposomes are packaged in an amber vial. 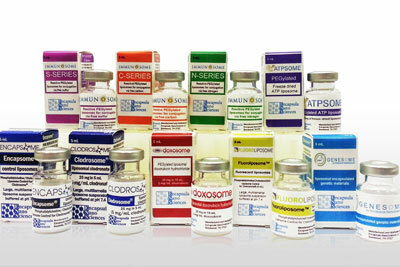 Immunosome®-Biotinyl Cap is made on daily basis. The batch that is shipped is manufactured on the same day. It is advised to use the products within 4 months of the manufacturing date.